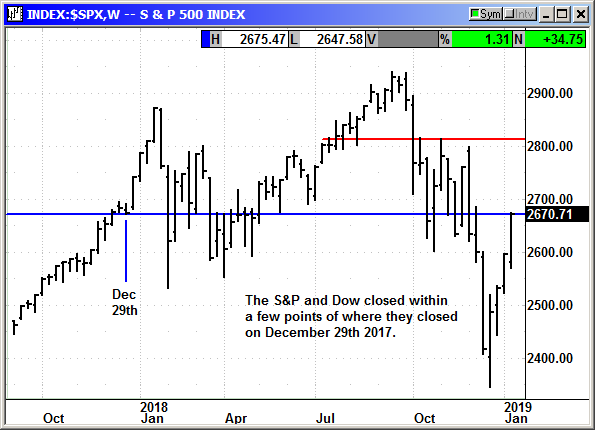 The Dow and S&P closed on Friday within a couple points of where they closed 2017. 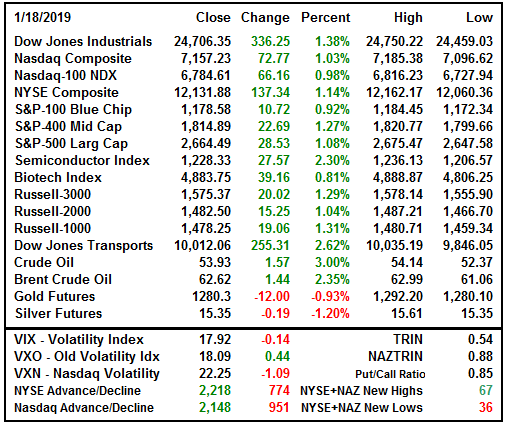 The futures were already positive overnight before the news broke of the potential offer from China to buy $1 trillion in goods from the US over the next six years. That would push the deficit with China to nearly zero by 2024 as purchases ramp up. They can easily accomplish this with purchases of food, oil and LNG. These are things they need in abundance and we have plenty to sell. Since negotiators are not going to meet again until two weeks from now, this was seen as a "soft" offer or a trial balloon. They made a suggestion in the press and both countries will see how it plays out with their parties. This would give both presidents something to claim as a big win and not really have to get into much detail on the harder issues. The key will be whether President Trump is desperate enough for a win that he withdraws his demands for intellectual property reform and forced technology transfers. These are the more important problems and the ones hardest to correct. Most believe it will take a concerted and lengthy effort by the WTO and TPP members to force China to make the changes. Analysts do not believe Trump can force China to do anything on those issues. Trade representative Lighthizer told Senator Chuck Grassley last week that he did not see anything material being changed. 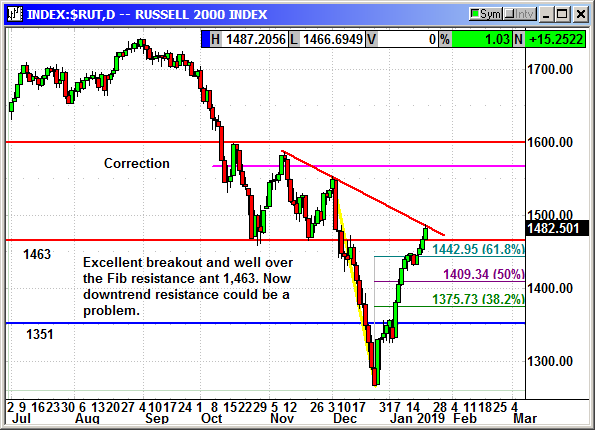 Since the president watches the market constantly as a barometer of his success, he may want to notch a big win on the surface and decide to fight again on the remaining problems if he is reelected. That would remove a major cloud from the market today. Investors are so excited that there may be an end to the China trade problem that they were buying everything in sight on Friday. If this continues next week ahead of the meeting with China, we could see a sell the news event if a deal is eventually announced. All the expectations would already be priced into the market. The Consumer Sentiment report for January was a huge disappointment. The headline number declined from 98.3 to 90.7 and the lowest level since October 2016 and just before the presidential election. There are 800,000 people out of work and daily feuds between the president and democratic leaders suggest the shutdown could go on for weeks. 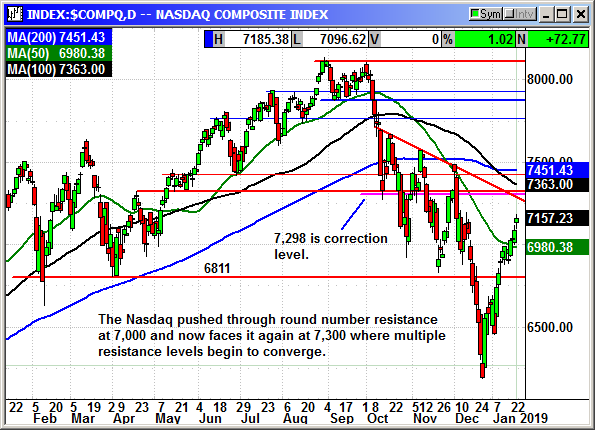 The Nasdaq had fallen more than 25% int a bear market at the end of December. I am surprised the headline number was not lower. The present conditions component fell from 116.1 to 110.0 and the expectations component fell from 87.0 to 78.3. Businesses reporting improved conditions declined from 59% to 45%. Take 800,000 spenders out of the market and you are going to see an impact to retail expectations. I doubt anyone is going to get too upset over this number since it was clearly the result of the government shutdown. If the government were to reopen next week it would probably be several months before sentiment returned to prior levels. It rises slow but comes down fast. Industrial production rose 0.3% for December, the seventh consecutive month of gains. It was a close call because utility production declined -6.3% because of unseasonably warn weather. The nationwide blizzard this weekend will pump up production numbers for January. 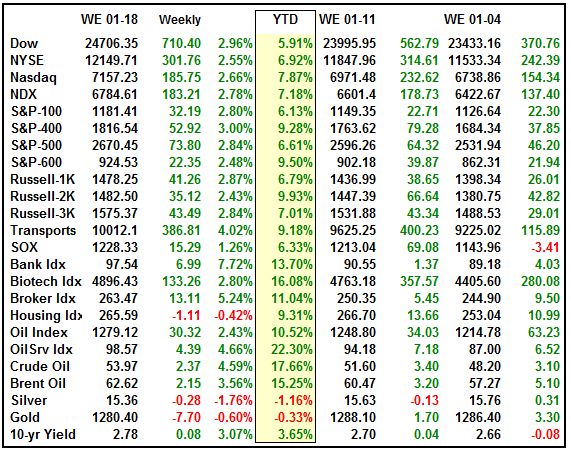 Motor vehicles and parts rose +4.7% and mining/energy +1.5%. Those two categories offset the decline in utilities. Manufacturing output increased 1.1% and the largest gain since last February. That represents a 3.2% rise over the last 12 months. Total capacity utilization rose 0.1% to 78.7% and the highest level in four years. The report was ignored. 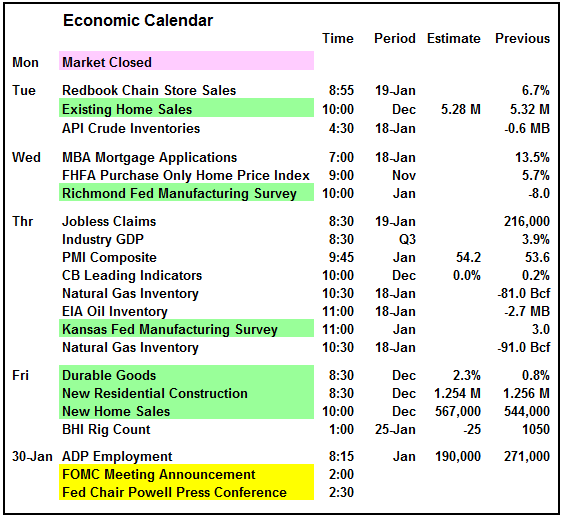 The few reports we had over the last week offset each other in GDP impact. 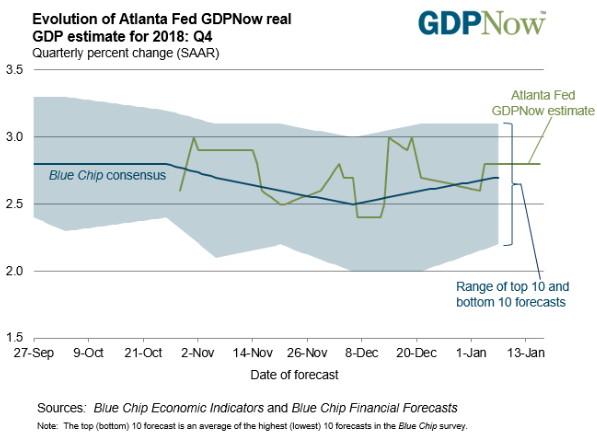 The Atlanta Fed real time GDPNow forecast for Q4 is 2.8%. The first look at the Q4 number is scheduled for Wednesday January 30th but it will not happen unless the government shutdown ends. 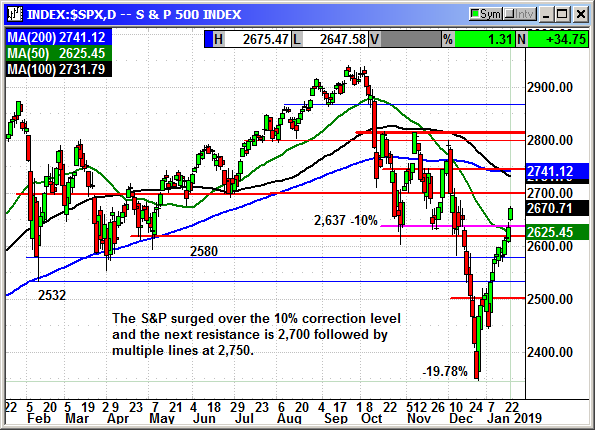 Analysts are mostly in agreement that the shutdown is subtracting between 0.1% to 0.15% from Q1 GDP each week. 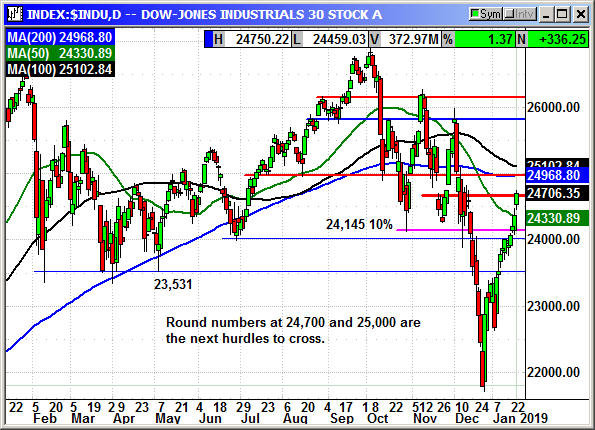 If it continues past the end of January that number rises to -0.2% per week. People will have spent their savings and drained their checking accounts and the consumer spending shutdown will be in full bloom. Most shutdowns last about a week. They rarely even produce a noticeable drop because impacted families have a week or two of cash in their accounts and credit cards. After two weeks those assets have been plundered and they are starting to look under the sofa cushions, emptying the piggy banks and cleaning out the change holders in the car. After four weeks they are taking stuff to pawnshops and borrowing money from friends. This creates more debt and takes longer for the depression period to be erased once the shutdown is over. Some of the reports listed may not appear because of the shutdown and the impact on government agencies but I listed them anyway just in case there is a breakthrough in the standoff. Next week is Fed week again. It seems like the meetings are coming with increasing frequency but that is only because the uncertainty is causing them to be more traumatic and that produces more coverage in the press before and after the events. Every meeting in 2019 will have a press conference and the potential for a rate hike. At least that was the idea when Powell set it up this way six months ago. He was anticipating rate hikes in 2019. 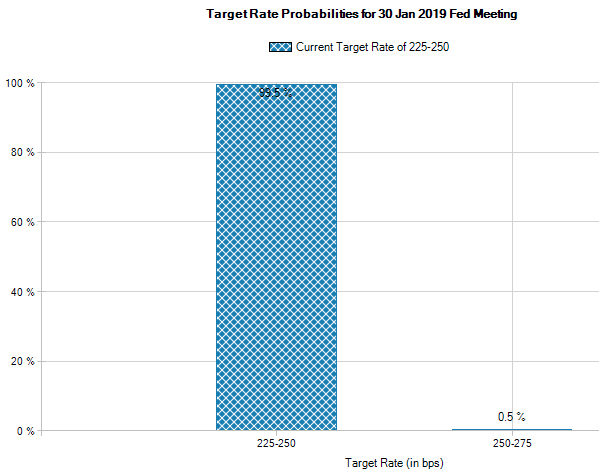 Currently there is only a 0.5% chance of a rate hike at the January meeting based on the Fed funds futures. 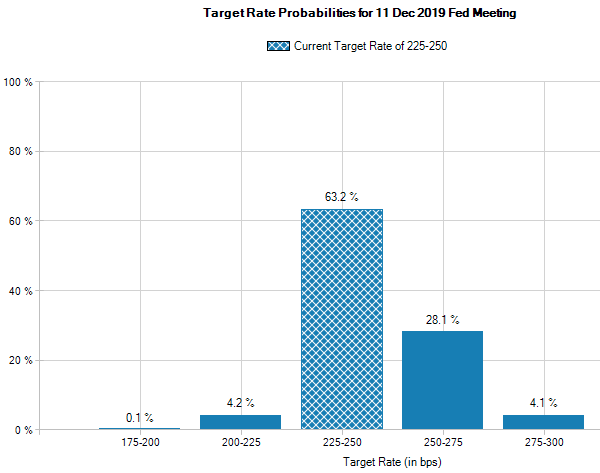 Even if you go all the way out to the December meeting there is only a roughly 28% chance of a rate hike. This means that at some point in the year, Powell is going to upset the market with an unexpected hike, but most believe July would be the earliest potential hike and even today there is only a 31% chance based on the futures. 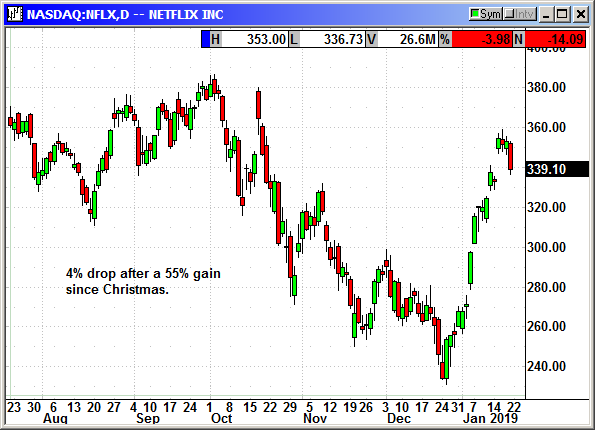 The big news for Friday was the reaction to the Netflix earnings after the bell on Thursday. Earnings of 30 cents beat estimates for 24 cents. However, revenue of $4.19 billion missed estimates for $4.21 billion. The 30 cents of earnings were only one third of the 89 cents they posted in the year ago quarter as the company pours money into content generation. They created 781 hours of original content in Q4. They added 1.5 million domestic subscribers and 7.3 million international subscribers. The 8.84 million totals easily beat their own projections for 6.1 million. They ended the quarter with 139.26 million paid members. They probably have twice that many if you count the shared passwords where people are not paying. Netflix said they now accounted for more than 10% of TV hours watched in the US. More than 80 million people watched the recently released movie "Bird Box" with Sandra Bullock. That is 2 hours of my life I can't get back. In addition to the minor revenue miss they guided for 21% revenue growth in Q1. That was below estimates for 24.1% and $4.59 billion. For the full year in 2018 revenue rose 36% to $15.79 billion and missed estimates for $15.81 billion. They guided for Q1 earnings of $253 million that missed estimates for $371 million. CEO Reed Hastings said they lost more viewers to the game Fortnite than they did to HBO or any of the other streaming networks trying to garner eyeballs. Shares declined 4% after the earnings BUT 22 analysts upgraded the stock or raised their price targets. The key point was a claim by Hastings that costs have peaked and would remain flat in 2019 and then decline. Cash burn in 2019 would be the same $3.1 billion as in 2018 but then decline. Basically, after ten years of rampant growth and creating thousands of hours of original scripted content, they expected to be at a point where revenue will eventually exceed costs and profits will increase. Amazon got a pass for the last 18 years because they were building the business. Earnings were nonexistent and everyone believed the Bezos dream of build it and they will come. The same has been true for Netflix. They have been given a pass in years past because of the rampant growth of the business model. They are growing so fast, all the new startup streaming companies will be a decade behind them and most will never progress out of a domestic audience. By the time Disney has 25 million subscribers, Netflix will have over 200 million, maybe well over 200 million. They are growing at the rate of 8 million per quarter and that number is accelerating. Now that Netflix is in more than 190 countries and their infrastructure is already built they are a decade ahead of everyone else. Nobody else can afford to spend the $100 billion it took for Netflix to get to this point. 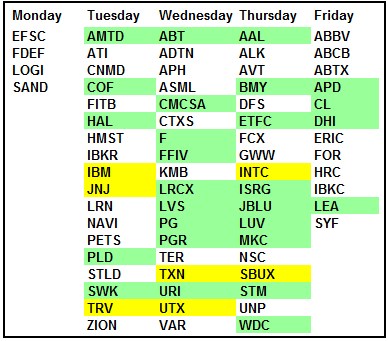 Of the 14 analysts that raised their price target on Friday, the average target was $430 with the highest at $500 by Pivotal Research Group. 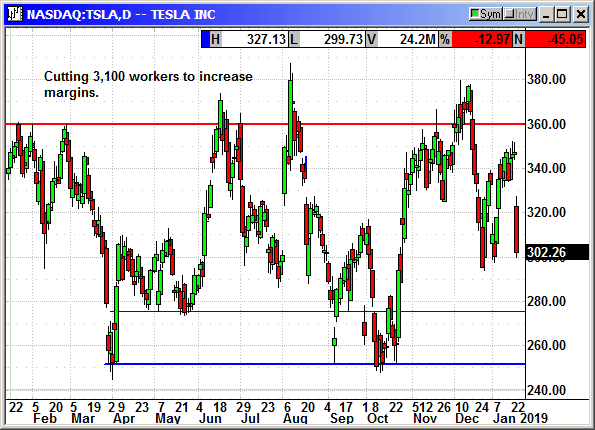 The lowest was Nomura at $320, a $20 increase. 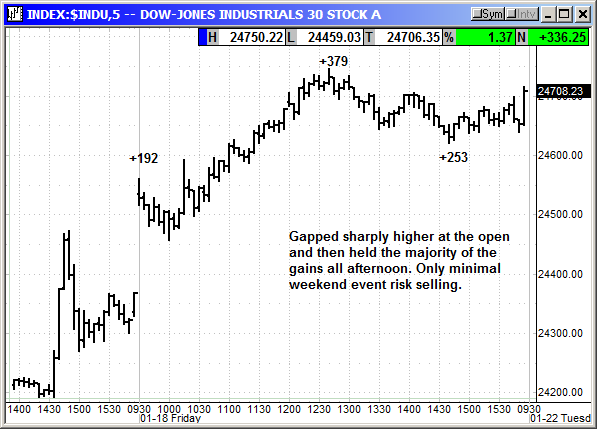 There were 12 targets hikes over $400 just on Friday. Give up buying options on Netflix. 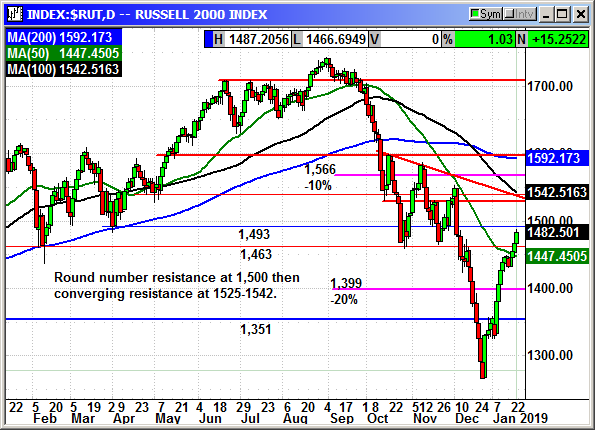 With the stock at $340 it would cost you $17 to buy a $400 call for June. A better plan would be to buy a $350 call for $35 and sell a $320 put for $27 and have a net debit of $8 for a position only $10 OTM. Tesla (TSLA) shares were knocked for a 13% loss after the company said it was laying off 3,100 workers to increase margins. The company said it would report a profit for Q4, but it would be less than the $312 million is posted in Q3. Musk said they were still ramping up Model 3 production ahead of the end of tax credits on July 1st. He said Tesla had to continue making manufacturing improvements and reducing costs in order to make a 220-mile range Model 3 for $35,000, which was the original goal. He said the most affordable current offering was a 264-mile car with premium sound and interior for $44,000. As of July 1st, the price of a Model 3 will rise $1,875 when the tax credit ends. The company delivered almost as many cars in Q4 as they did in all of 2017. Musk said the company would post a minor profit in Q4 "with great difficulty, effort and some luck" thanks to accelerated shipments of higher priced cars to Europe and Asia. Tesla increased its employee count by 30% when they were racing to produce high volume of the Model 3 to satisfy investors and the backlog of customers. 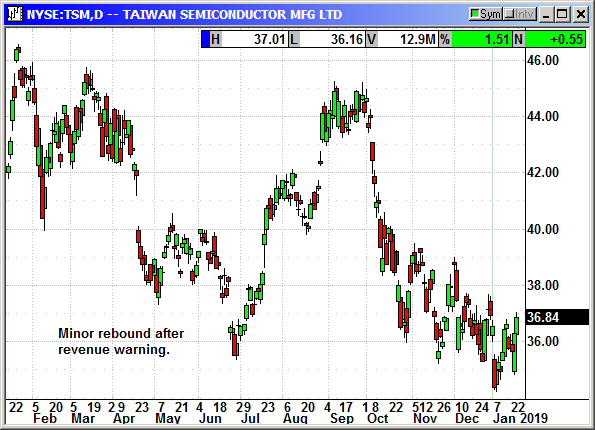 In the earnings warning there was no guidance for future production. Musk had promised 10,000 Model 3s per week in 2018 and then lowered that to 7,000. They are currently producing just under 5,000 after having hit that number several times. Analysts believe they will never hit 10,000 and probably reach a sustainable 5-6,000 sometime in 2019. Musk is finding out that making cars is hard and Tesla is probably running out of buyers willing to pay $60-$75K for a fully featured Model 3. The remaining reservations are more than likely for the budget model and that is where profits are hard to produce. 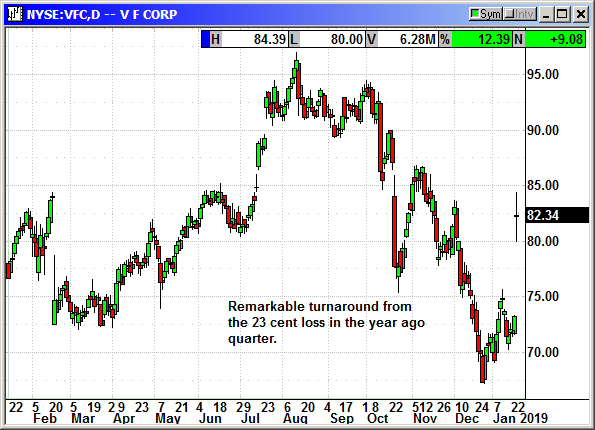 Apparel maker VF Corp (VFC) celebrated its earnings report with a 12% gain in the stock. The company said it was seeing high demand for its Vans shoes and North Face apparel. They reported earnings of $1.31 that beat estimates for $1.10. They posted a loss of 23 cents in the year ago quarter. Revenue rose to $3.94 billion and beat estimates for $3.87 billion. The division not doing well was the Lee and Wrangler jeans where revenue is expected to fall 3% in 2019. The CEO squashed rumors they were going to acquire Skechers saying the rumors were not true and the product would not fit well in the current portfolio. 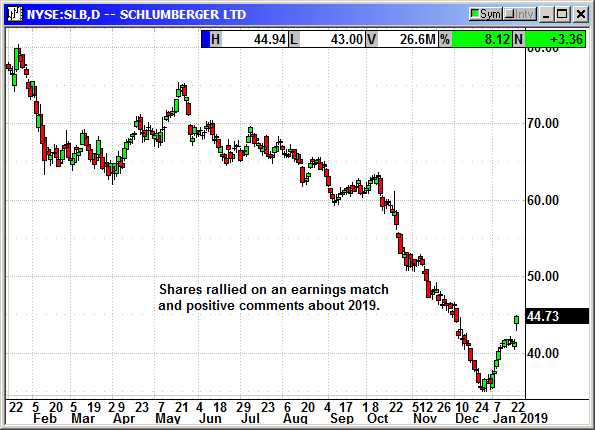 Oil services giant Schlumberger (SLB) reported earnings of 36 cents that matched analyst estimates. This was substantially better than the $1.63 loss in the year ago quarter .Revenue declined slightly from $8.504 billion to $8.180 billion but still beat estimates for $8.044 billion. 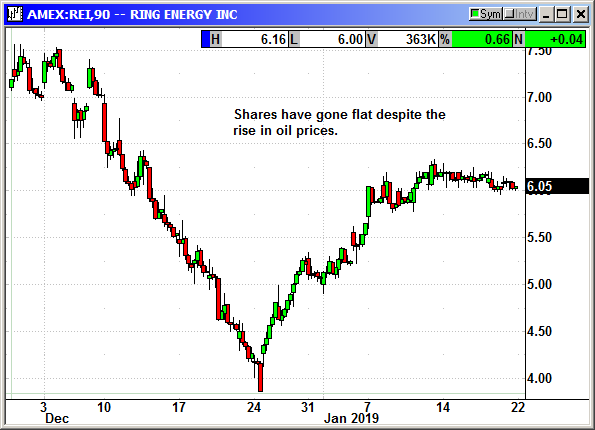 The company said the surge in shale production even while oil prices were falling, helped them to improve their earnings. Oil production hit a record 11.9 million bpd last week. Schlumberger said 2019 should provide a more stable supply/demand balance once Russia and OPEC complete their production cuts. The CEO reminded that the exceptions to the Iran export sanctions will expire six months after the sanctions were imposed. Schlumberger said they were cutting back on capex in 2019 to a range of $1.5-$1.7 billion and down from the $2.1 billion in prior guidance. 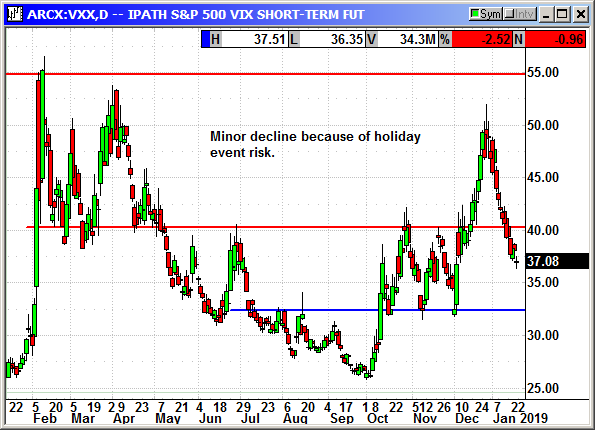 They warned that the volatility in crude prices has led to more uncertainty among producers. 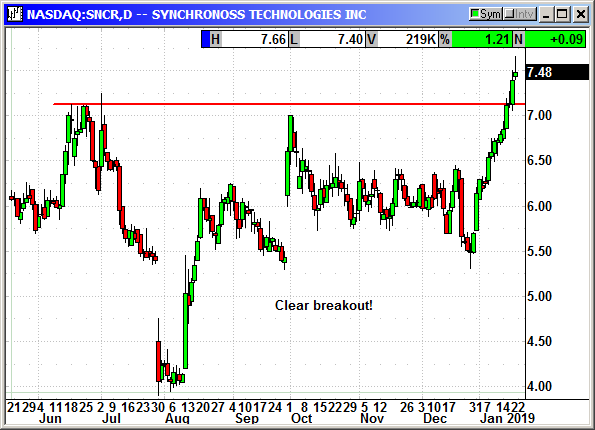 Shares rallied 8% on the report. Alibaba (BABA) said it was cutting spending on travel and postponing new hiring until April. 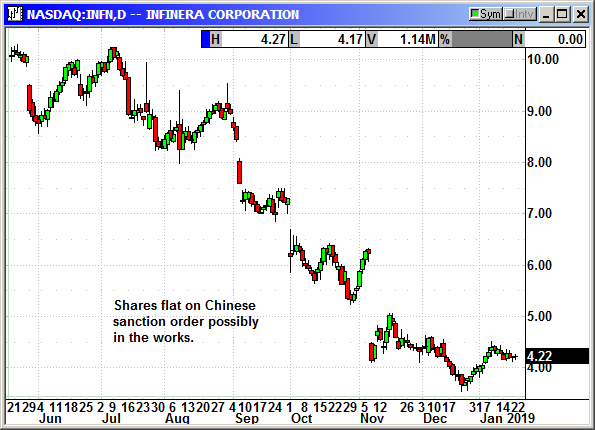 The company is bracing for a slowdown in the Chinese economy. 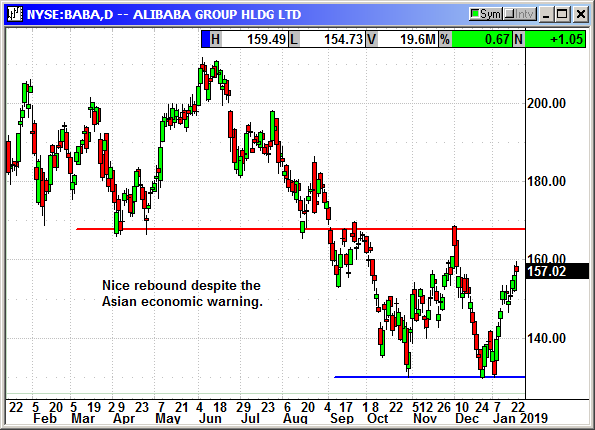 Chairman Jack Ma said the trade battle with the US was causing a slowdown all over Asia and was hitting all sectors. Offers to prospective new hires were only effective if they agreed to start in April. The company is restricting air travel and no longer paying for expenses like cab fares. China is expected to grow at a 6.2% pace in 2019 and the slowest growth since 1990. Car sales in 2018 fell for the first time in more than 20 years. Debt to GDP rose to 253% up from 140% in 2008. No country in history has ever been able to solve that large of a debt crisis without a financial calamity. The US debt to GDP is 108%. Some 24% of outstanding loans ($8.5 trillion) in China are non-performing. That means they are no longer making the payments, but the banks are keeping them on the books rather than take the pain of writing them off. 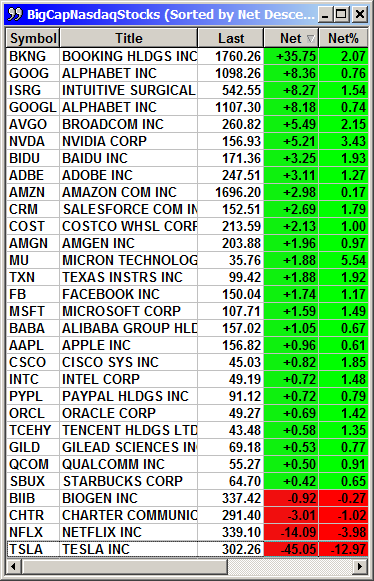 Apple shares were positive but only barely. The cloud hanging over Apple grew darker after Taiwan Semiconductor (TSM) warned of a major earnings miss because of declining smartphone sales. Q1 revenue is now expected to be in the range of $7.3-$7.4 billion, down 14% and well under the $8.1 billion analysts expected. The company said slowing demand for high end phones had caused a sharp increase in inventory levels. TSM received 45% of its income from smartphones and Apple is its biggest customer. They said due to the sector outlook they were cutting capex spending by several hundred million dollars. Analysts warned that channel checks suggested the surplus inventory of phones could continue for the first half of 2019. 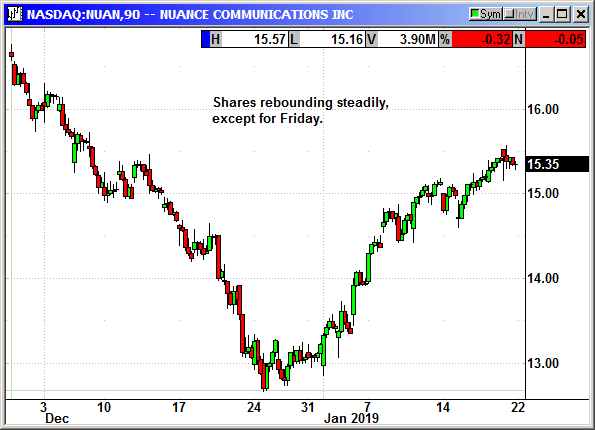 Shares posted a small gain after a decent rebound on Thursday. Analysts are still positive on Apple but continue to cut their estimates given the universal slowdown in the chip sector. Apple is getting pushback from developers for its high prices in the App Store and the prior upgrade cycle trend is fading fast. Without some killer feature on the 2019 lineup of phones, and a lower price, the company could warn again. Phones, with the exception of the iPhone, are getting cheaper. Apple was forced to cut prices by 20% in China last week to compete with lower cost models and flush out a buildup of inventory in China. 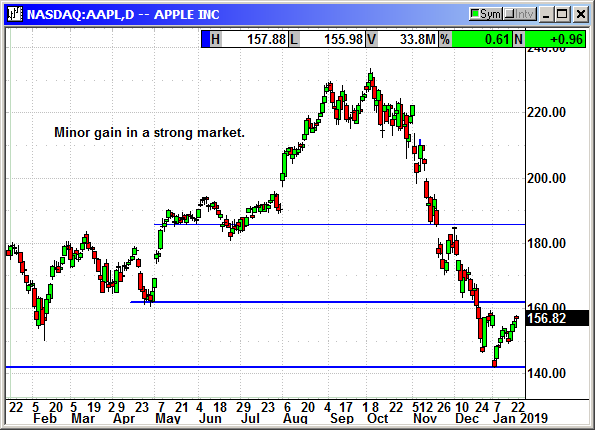 Numerous analysts love Apple but are concerned earnings could be even less than expected. 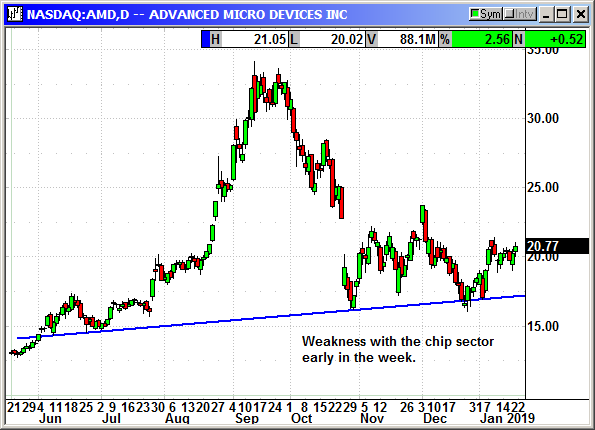 Apple warned but conditions have come to light since then that produced more concern. Facebook (FB) is under the gun and the FTC is considering a "record" fine for its recent privacy mistakes. 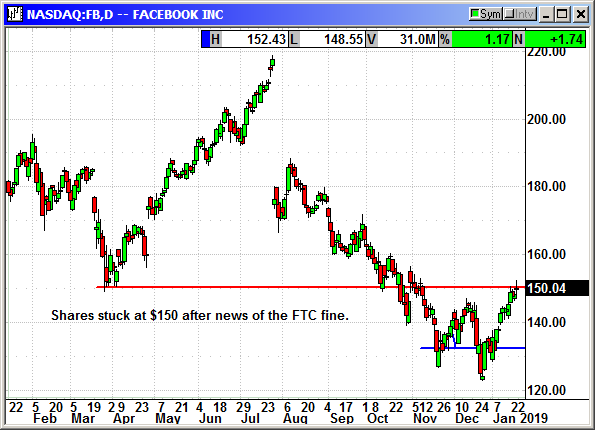 In 2011 the FTC entered into a settlement agreement with Facebook over repeated privacy violations. The settlement agreement period runs until 2031 and requires Facebook to get explicit permission from users before sharing any personal information that is not already covered by their privacy settings. Facebook has violated this settlement multiple times over the past year and the FTC is planning on making them pay a lot for their transgressions. The feeling is that it will be enough to force them to do a better job of policing in the future. The FTC will not comment officially but we saw a $5 billion fine in Europe against Google. The repeated violations of the privacy rules by Facebook when they already have a privacy settlement in place, suggests this fine could be a whopper. Facebook has 2.2 billion users so just $2 each would be a major fine. Ten months ago, the Cambridge Analytica scandal broke and Facebook was tortured for months with testimony and public humiliation. In December they acknowledged the photos of 7 million users had been shared publicly even though they were private. Facebook is also under investigation in multiple other countries for the same problem. This is going to be painful. 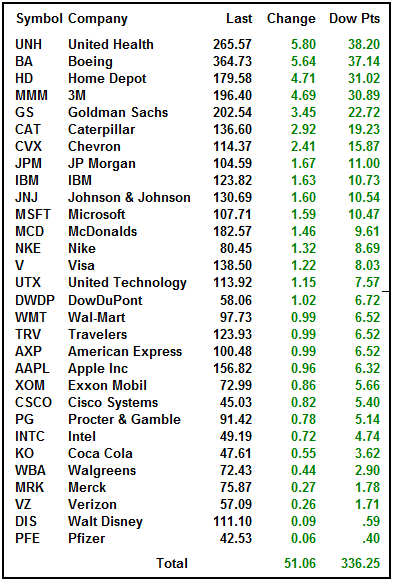 Earnings are January 30th. 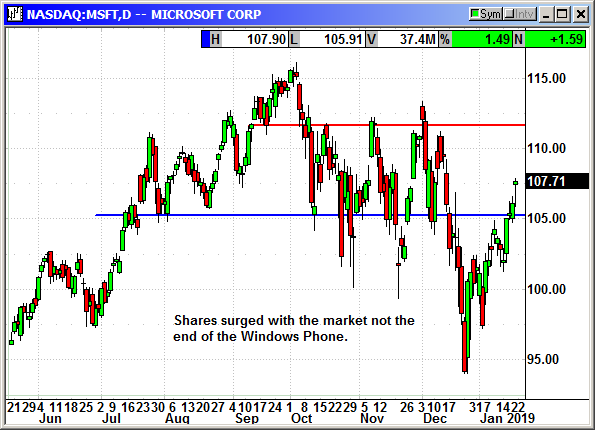 Microsoft (MSFT) is getting out of the phone business. They recommended that anyone using a Windows Phone using the Windows 10 mobile platform should immediately switch to an iOS or Android device. On December 10th, 2019, Microsoft will stop providing new security updates, hotfixes, assisted support options or technical content updates from Microsoft. Microsoft spent tens of billions of dollars trying to produce a competitive Windows phone. They even bought Nokia for $7.6 billion in order to produce their own phones. They eventually wrote that acquisition off as a failure. If you have a Windows Phone, save it for 20 years and sell it as a historical antique much like old Apple computers today that go for thousands of dollars. Crude prices surged on Friday after the $1 trillion trade proposal was floated by China. Getting a trade deal done and especially one where China buys that many products from the US would increase oil demand. China is a major importer of oil. If they complete a trade deal that removes all the tariffs it means China's factories can go back to work at full production and that requires more oil. The US is becoming a major oil exporter at 2-3 million bpd and rising. If China signs a $1 trillion deal, oil purchases and LNG purchases are going to be on that list. 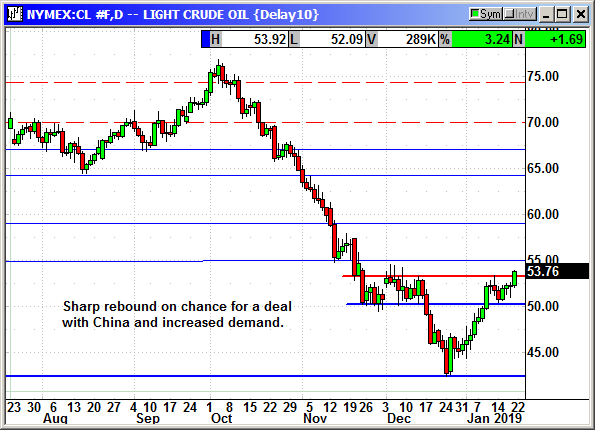 Having a big buyer locked in will support WTI prices long term. Crude closed at a two-month high. 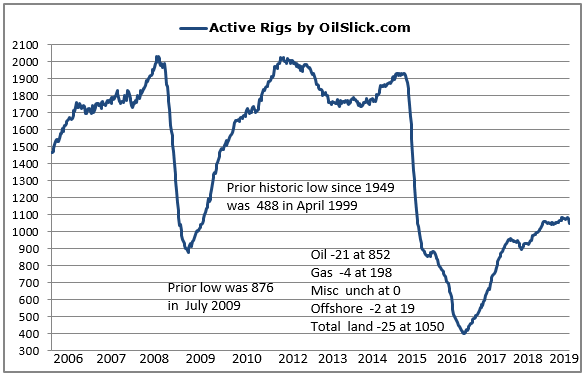 The three months of falling prices finally took a big toll on active rigs. Land rigs in the US fell by a whopping -25 for the week ended on the 18th. Twenty-one oil rigs and 4 gas rigs were taken out of service. An additional two offshore rigs were offline. Despite the decline in rigs, oil production rose 200,000 bpd to 11.9 million bpd and a new record. The EIA said last week that US production will rise to average 12.9 mmbpd in 2020 and lead the US to export more oil than it imports. The average production in 2018 was 10.9 mmbpd. That will rise 2.0 mmbpd by 2020 to average 12.9 mmbpd but that means the actual production at year end will be well over 13.0 mmbpd. At the end of 2018 net imports into the US fell to 2.4 mmbpd because our exports were rising rapidly. By the end of 2020 the EIA expects the US to become a net exporter by 900,000 bpd. 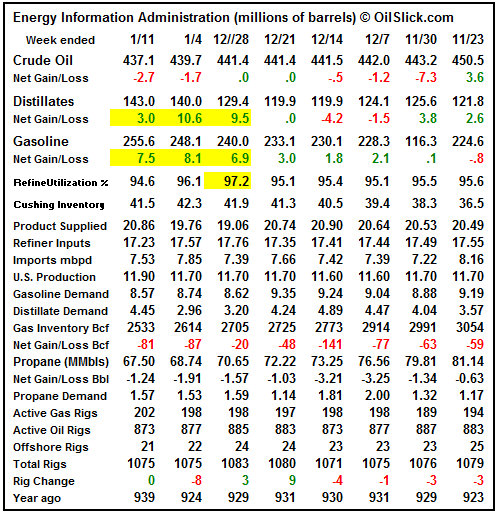 Refined product inventories continued to grow but oil inventories are barely declining. Refinery utilization declined sharply to 94.6% for the week ended on the 11th. "If you believe it will work out, you will see opportunities. If you believe it won't, you will see obstacles." Rumors flying, shares rising, outlook positive. What's not to like? Investing on acquisition rumors is normally a losing proposition unless there are strong fundamentals as a fall back reason. 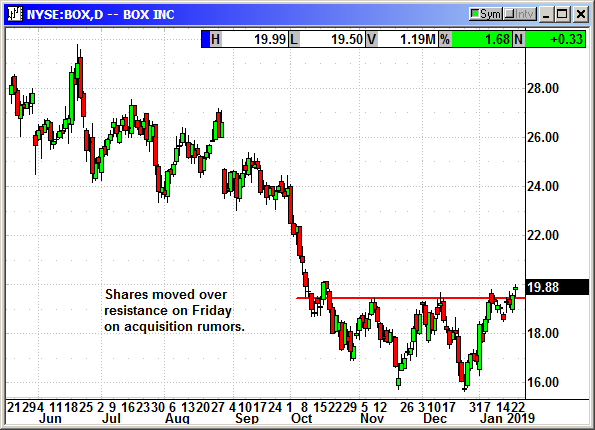 Buy BOX Shares, currently $19.88, stop loss $18.35. Optional: Buy March $21 Call, currently $1.05, stop loss $18.35.